I hope you all had a lovely Christmas and are enjoying the post Christmas peace. I love the period between Christmas and New Year so many pyjama days and nowhere to be at any given time. So relaxing. I just wanted to share a little gift I made for my hubby's brother and his lovely partner. I used this year's Christmas photo of my boys to decorate a calendar for them. I picked these calendars up for a few dollars at one of the cheap shops in town. They originally have a little whiteboard on top and I have used sticky strip to attach a little layout over the top and then repunched the hanging hole with my trust crop-a-dile. I added an eyelet as well for strength. I used my Sizzix to cut out the numbers for the year. 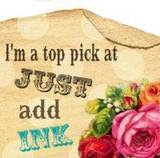 This month's challenge at Stamp-a-memory is to scrapbook about a gift or make a gift so I think this fits the criteria. this is a such a great idea - thanks for taking part.